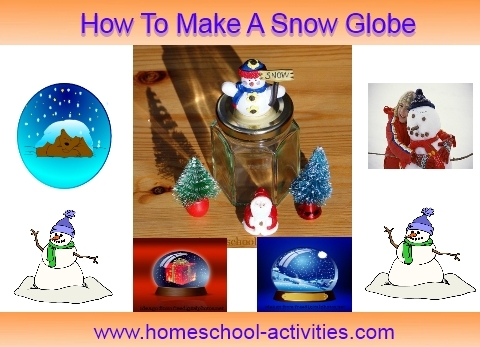 Making your own snow globe has to be a perfect fit for homeschool winter crafts for kids! 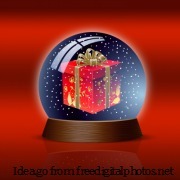 Being able to hold Santa and his snowman in your hand and watch it snow is a magical scene for Christmas time. 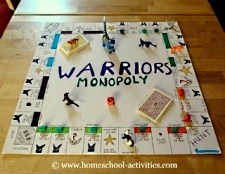 Our homeschool how-to instructions are simple to follow and make great gifts too! My friend Lisa Vaught got together with some friends and had a great time making some - so we thought we'd share our top tips. Photos in this step-by-step guide are by my friend Lisa Vaught. 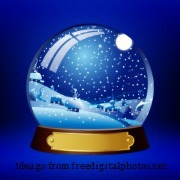 Choose some festive figures to go in your snow globe. 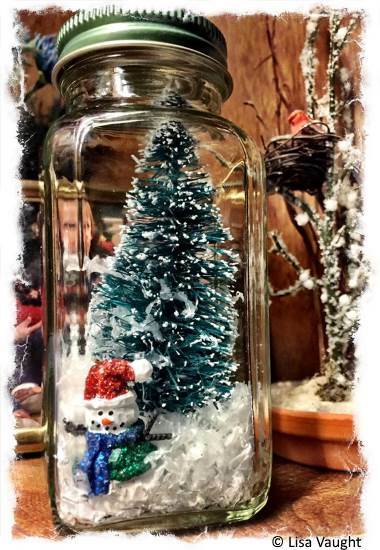 Winter crafts for kids seem to work even better if you involve Santa and a snowman! You need to choose plastic or ceramic figures as rusty ones could be rather disappointing. 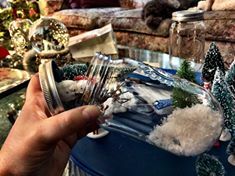 Choose a small pretty glass jar for your Snow Globe. We used a honey jar from a homeschool friend who is a beekeeper. Olive jars or even baby food ones would work well. 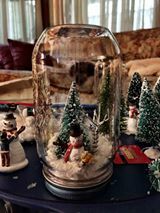 If you want to make the lid of your homeschool snow globe more festive, paint it a nice red or green with an oil based enamel paint. Stick the figures onto the inside of the lid. You may need to roughen up the surface slightly first with a bit of sandpaper and use a clear drying epoxy glue. 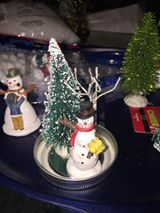 Add some fake snow to the jar. 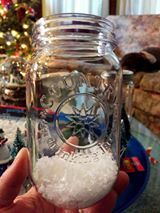 If you want some extra fun winter crafts for kids, fill the jar with distilled water and get ready to add some glitter. 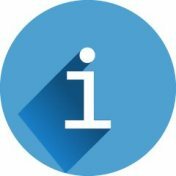 To stop the glitter falling too quickly, you'll need to add some glycerol (available from drugstores). Don't overdo it, or the glitter will stick to the bottom of the jar. 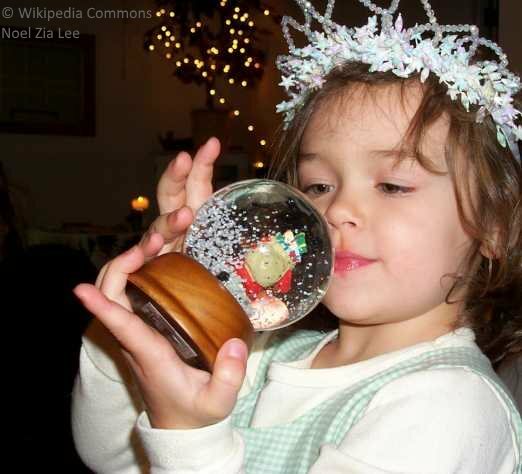 Screw the lid back on your snow globe. 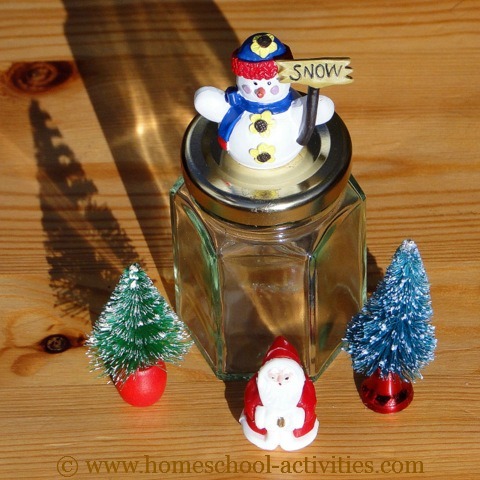 Flip the jar over and back again for perfect winter crafts for kids. 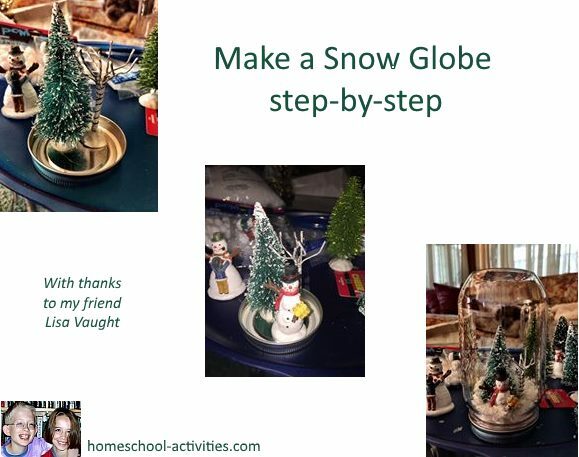 Snow globes are just one of the fun homeschool winter activities for kids you can try. You'll see in our Christmas math activities that playing games is a great way to sneak in some homeschool number work over the festive season, but what we didn't say is that making your own board game is a great way of doing that AND enjoying some winter fun! 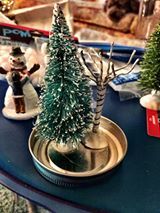 You could try making a winter diorama with Santa and some of his deer friends based on the shoe box idea we show you in our homeschool ocean diorama. 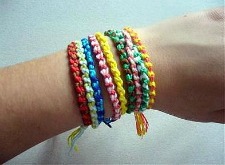 We love this page from Sandy which shows you how to make friendship bracelets. Making bracelets is great for winter crafts and they make very special presents too. 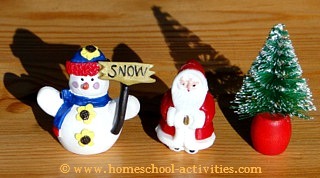 You'll find more homeschool Christmas ideas for kids here.